The morphologic spectrum of paratesticular leiomyosarcomas is similar to that seen in other soft tissue locations. 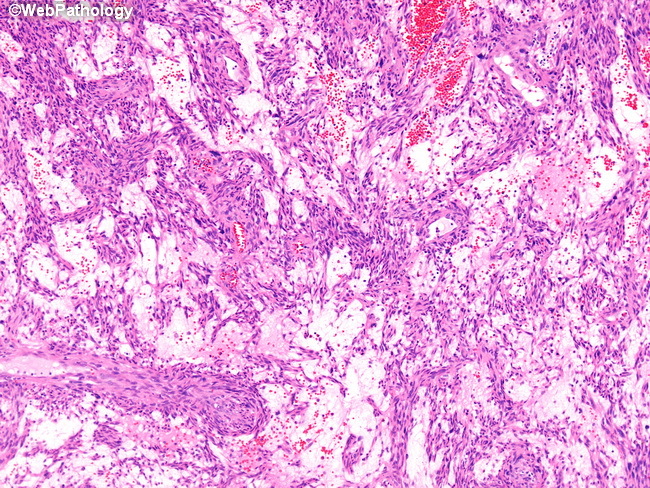 Most cases show classic features consisting of intersecting fascicles of smooth muscle cells with brightly eosinophilic cytoplasm and blunt-ending nuclei. Some cases have prominent myxoid stroma (shown here), inflammatory component, or epithelioid foci.